LMAO! This is so awesome. You rock. This is very cute! The title did worry me though lol! Cute and I totally knew what they were at first glance! these are fun! The silver is very pretty--awesome idea! Colours were bang on. Great mani! Sidenote: I hate hard erasers!!! Just wanted to let you know that I picked up some Seche Vite top coat because of your blog, and so far it's been amazing! No chips!! These are very realistic, I bet they look funny when you type or something. AMAZING! These are some of my favorite yet! I am a total pencil nut, so I worship your nails right now!!!! Even my husband said "Wow, those are pretty cool. They look just like pencils." - and that's a ringing endorsement from him! I love how you got the silver to actually look like a pencil ferrule! That is just SO SUPER cool. Forgot to ask, when you scratch your nose, does it vanish? was afraid of what we might see. Nubar chocolate collection, anyone? Oh, this would be so cool if they were real. It'd be so much easier to erase...haha. But after a lot of erasing you would have to wait for them to grow again. LOVE IT!!!! You always amaze me! Keep it up! Love them! I have been meaning to tell you the dance nails remind me of ants at a picnic. Perhaps a summer, spring idea? Wow that's so creative! I'd never have thought of that!!! This is an awesome design! I just realized that if I tried this on my nails though, my pencils would look like the stubby pencils you can't quite bring yourself to throw out because they still have a little life in them yet. AWESOME BLOG, so glad to have found you! Wow. I do not think I have seen anything like this before. How fun! Sharing a link to this with my Facebook readers. Is it all right if I share this pic on my FB page? I'm a former teacher and my teacher friends would love this. Thanks. absolutely, all I ask is that you credit the source and provide a link to the website. :) Thanks for asking! These are so clever! I featured you today in my 19 Creative Back to School Ideas and Treats Round-Up. Feel free to grab a button! 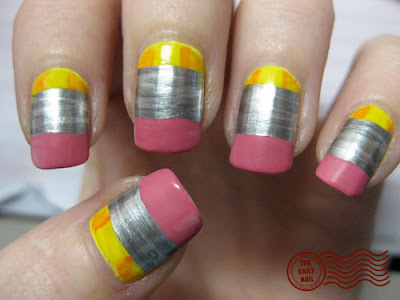 Oh god, these pencil nails drives me crazy! please post more stuff like this as soon as possible. Love your blog - so creative! Found this on Pinterest, it was linked to a collection blog, which had credited your page. Which URL would you prefer listed on the pin, here, or the Buzzfeed article? Your content, your choice! Love the design, had to pin it. So cute! I just shared a link to your oh-so-cute pencil mani on my Ivy Lane Designs Facebook page. Fabulous! Love the colours and just so cute.